It is becoming customary to celebrate Apple Day with the communal pressing of apples to make juice or drying them to make apple chips Many of the windfalls will not be suitable to eat or drink,but could be composted, and I felt it might be useful to expand the advice I have previously given on composting apples. Apples and other fruit such as pears, banana skins, strawberries, peaches and all melons, can normally be added to the composting or worm bin as and when they are no longer suitable for eating and this includes the occasional windfall during the summer months. Chopping the apples will of course speed the composting process. Where there are a lot of apples I believe it is best to use a bin and to layer them with browns and continue making alternate layers of apples and browns until all the windfalls have been used. If you only have a few trees it might be better to collect the apples in a storage container i.e. a bucket or bin so that you have enough to make several layers about 4” thick at the same time. If possible, other greens should be added at the same time as the chopped or pulped apples to introduce air spaces and variation into the green mix. Creating the correct green brown ratio is important to prevent the apples fermenting and producing an unpleasant smell. One-part green to two-part brown material is traditional recommended although many composters settle for about equal quantities. The RHS suggest that apples should be no more than 20-25% of the total compost material. ( https://www.rhs.org.uk/advice/profile?pid=444). Layering is not essential but in dealing with a large amount of fruit it does make it easier to get the initial green/brown balance right. For the first week the material benefits from being turned daily to aerate the mix ensuring that microbial activity heats the content. When aerating move the material on the outside of the pile toward the centre. Reduced frequency of mixing as the effect decreases. (See the section on hot composting) if you have a thermometer monitoring the temperature it can provide additional interest (especially for children). Do continue to check the compost condition weekly. If it becomes to dry it will stop working while if too wet anaerobic bugs will take over and the temperature will fall, and the smell will increase. If dry add water a little at a time, if wet add more browns e.g. dry leaves. After two or three months the compost should be finished dark brown in colour with an earthy smell and no apples identifiable. If you have fewer apples and intend to add them to a bin already in use a simplified technique can be used, If the apples are whole chop the apples with a spade and add to the bin to make a layer two or three deep. Cover this with a wet leaves, bedding from vegetarian pets, rough compost or old straw. Repeat the process adding apple and brown layers until the apples have been used. Finish with a layer of browns to reduce odours and insect pests. Using this cold composting process, it may take up to two years to produce good quality compost. 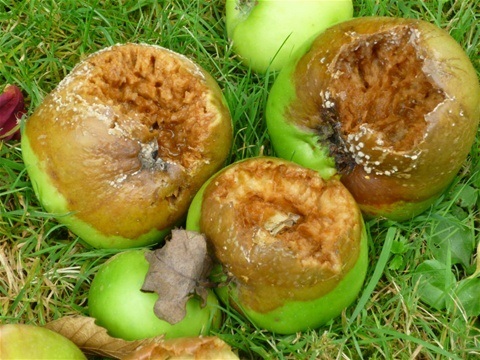 Often windfall apples will be diseased and although cold composting will not reach temperatures that necessary to kill the more persistent pathogens, they are suitable for disposing of material infected with fungal diseases such as powdery mildews and rusts. In some countries the apple maggot, is a problem and its spread can result from cold composting at home or on the allotment. If apple maggot is a problem in your area check the apples before adding them to the bin. Infected fruit will show damage throughout the flesh and turn brown and mushy as the maggots burrow throughout the apple for up to up to 30 days. This widespread damage enables apple maggot infection to be distinguished from that caused by the more common codling moth, which burrows straight to the apple core leaving most of the fruit undamaged.